Packers quarterback Aaron Rodgers threw for 177 yards against the 49ers and finished the game with a passer rating of 97.8. By Aaron Rodgers’ own admission, this wasn’t his best game. On the Packers’ first three possessions, Rodgers was 0-for-2 passing with two sacks and one fumble. Rodgers’ passer rating ended up being a respectable 97.8, but he threw for just 177 yards. San Francisco is a better team than Green Bay in nearly every area, but the Rodgers Factor can be the swing vote that changes everything. However, Rodgers didn’t make a big enough impact to help his team overcome its deficiencies in other areas. Rodgers said after the game that the pass protection was "really good," but that’s more him just sticking up for his offensive linemen than it is telling the complete truth. Rodgers was sacked four times and the pocket was constantly caving in on him. He didn’t do a great job at times of getting rid of the ball quickly, but he was also frequently rushed through his reads. With a long passing play of just 26 yards, it’s apparent that the 49ers accomplished their goal of not letting Rodgers beat them deep. Jordy Nelson and James Jones both were unable to come up with long passes downfield, though neither were easy plays for the receivers. In Jones’ case, he was double-teamed and the ball was underthrown, yet he still had a shot at it. Only one Packers receiver had more than two catches in the entire game. Nelson was targeted eight times, catching seven of them for 62 yards and one touchdown. Randall Cobb had two big catches, a 25-yarder and a 26-yarder (on a huge fourth-and-2 play), but that was it. Jones had two receptions for 20 yards. San Francisco finished the regular season as the NFL’s third-best run defense. But, as they did so often this season, the Packers ran the ball successfully anyway. Eddie Lacy’s final line of 21 carries for 81 yards is relatively impressive, but it’s the way that he got those yards against such a good run defense than had the Lambeau Field crowd chanting "Eddie! Eddie! Eddie!" on multiple occasions. Lacy’s long run of the game was only eight yards, but he was consistently giving Green Bay positive gains, which opened up the offense. On the Packers’ fourth offensive drive, when they finally earned their first first down, it was in large part due to Lacy getting going. He carried the ball twice in a row, setting up a third-and-4 that was converted. Later that series, Lacy had four other four-yard runs. Those aren’t big chunks of yards, but at that point in the game, it made a huge difference for Green Bay’s offense. James Starks had a positive ending to his season as Lacy’s dependable backup. Starks had five carries for 29 yards, including the Packers’ longest run of the game for 10 yards. John Kuhn scored the only rushing touchdown for Green Bay on a one-yard fullback dive. Frank Gore was pretty much held in check. If defensive coordinator Dom Capers had been told Gore would finish with 20 carries for 66 yards and one touchdown, he’d take it and consider it a victory. For a defense without Clay Matthews on one edge and without Johnny Jolly up the middle, while also losing Mike Neal on the other edge in the first quarter and losing Sam Shields too, that was a job mostly well done by the Packers’ defense on Gore. Stopping Colin Kaepernick as a runner, however? That didn’t go as planned for Capers and his defense. Kaepernick ran it seven times for 98 yards, including a 42-yarder and an 11-yard run on the final series on third-and-8 that set the 49ers up from manageable field-goal distance. There were designed runs for Kaepernick, but he also scrambled and got away when he wanted to on all but one occasion (a Mike Daniels sack). Out of the four NFL playoff games on wild-card weekend, take a guess who the leading rusher was. It wasn’t Lacy, it wasn’t LeSean McCoy, it wasn’t any running back. It was Kaepernick. That level of QB rushing success is unlikely to result in a Packers win. Combine that with the playoff game from a year ago, and Kaepernick has rushed for 279 yards in two elimination games against Green Bay. The Packers forced the only turnover of the entire game, and it came on a Tramon Williams second-quarter interception that sparked Green Bay for a short bit. On the interception return, Williams even ran over Kaepernick, which only helped to light that spark for the Packers. It was the kind of the play of which Green Bay needed more. Late in the fourth quarter, Micah Hyde had his chance to make the second one and, fully extended in the air, he let the ball bounce off his hands and onto the ground for a significant missed opportunity. Instead of the Packers taking over in field-goal range with a chance to take a lead, San Francisco’s drive continued, and it turned out to be the last drive of the game — a game-winner. Hyde admitted that it’s a ball he should have intercepted, but he’s a rookie in a situation on which he obviously wasn’t quite yet ready to come through. Kaepernick finished the game completing 16 of 30 passes for 227 yards with one touchdown and the one interception (75.3 passer rating). The one touchdown pass came early in the fourth quarter when Kaepernick found A.J. Hawk matched up on Vernon Davis and connected with his tight end for the score. Morgan Burnett was late on the safety help. Unlike the Week 1 meeting between these teams, Anquan Boldin didn’t do much (3 catches for 38 yards). Michael Crabtree, however, made up for being out in Week 1 by catching eight passes for 125 yards. The loss of Shields early in the game especially hurt in these matchups, as it forced Davon House — who’s rarely been used on defense in recent weeks — to play nearly the entire game. Though Cobb only played 45 of 64 offensive snaps, he was back returning kicks for the first time since his injury. Unfortunately for the Packers, even Cobb couldn’t make his way through poor blocking upfront. Cobb’s four returns resulted in nothing better than 23 yards. LaMichael James had a 37-yard kick return for San Francisco. Tim Masthay did not connect well on one of his five punts, sending it just 29 yards, but the other four were good considering the frigid temperatures. Mason Crosby ended his strong comeback season on a high note by making both of his field-goal attempts, though the longest of the two was from just 34 yards. House nearly blocked the game-winning field goal, but he was offside, so it wouldn’t have mattered. And that’s how the Packers’ 2013 season ended. Once again at the hands of the 49ers, except this time it came at home. Rodgers thought all of the circumstances leading into this game meant there was "something special" about the 2013 season, but nope. 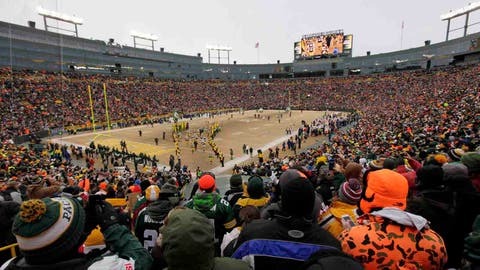 In fact, Green Bay has fallen yet another step further away from the Super Bowl. The Packers went from Super Bowl champions in the 2010 season to making it to back-to-back divisional round games, to now bowing out in the wild-card round. It’s not the direction any team wants to be heading. Capers didn’t have enough talent on defense to stop the 49ers. But considering the number of key players out, it seems like Green Bay may be fortunate to have kept San Francisco to just 23 points. Expecting undrafted rookies like Andy Mulumba and late-round picks like Hyde to step up and be stars at this stage is asking too much. It’s why it’s difficult to think that any defensive coordinator could have done any better given what Capers had at his disposal. Offensively, perhaps if Rodgers had an A-plus game it would have been enough to change the outcome. But he wasn’t as sharp as he usually is, and the lack of big-play success really hurt the Packers. In all, it’s another season gone and another season of Rodgers’ prime lost.